The main subtext of this game that really worked wonders for me is that, no matter what the time, humanity will never be any more or less human: never more or less open-minded, fearful, caring, or competitive. We can say “this is just a relative dark age” all we want, but humanity is humanity, and the blessings and ills of it will always be in tow. What happens to anyone in this world isn’t doom/fate/destiny; it’s humanity always being humanity. We have to fix and ameliorate that in every moment, not just defeat today’s foe externally. We have to actively mend who we are in our interactions. Throughout its many subquests, journal entries, and characters, HZD shows us intellectuals with and without compassion: people who are compassionate yet myopic and fearful; people who use brute force to lead both equitably and ruthlessly; and essentially all combinations and connotations, positive and negative. There is no one approach. There is no one humanity. And all variations have their horrors and honors in this struggle to survive. 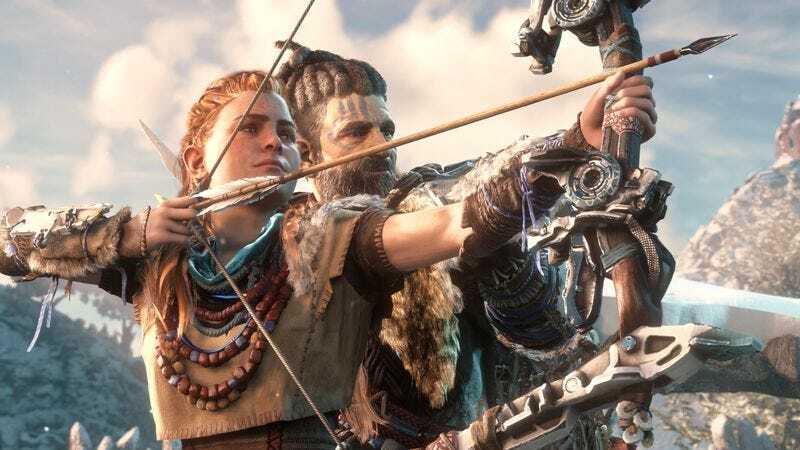 Your main character Aloy’s embodiment of ingenuity, compassion, and determination is the thread that brings the best of the people around you against the worst. Or, to quote James Tiberius Kirk summing this all up: “We’re human beings, with the blood of a million savage years on our hands. But we can stop it. We can admit that we’re killers but we’re not going to kill today. That’s all it takes. Knowing that we’re not going to kill. Today.” Normalizing and ignoring that process dispassionately to make means justified is in our power just as much as reveling in that endeavor to the detriment of the world around us, but in each of us is also the capacity to rise above that and elevate ourselves and our community with most charged spirit, soul, and unity. Also, “Darmok and Jalad at Tanagra” (TNG). And HZD doesn’t overplay these themes. It doesn’t say, “oh look what humanity’s deeds hath wrought upon us all.” It lets this main subtext breathe and develop fully through all your interactions and battles. In any moment, you can be the brute, the brain, or the heart and still survive. But a unified heart with purpose and care for all around it, utilizing empathy to its fullest extent, that is what paves the way for the future—humankind’s only real, enduring future if it’s to have one. GNOG feels like you’re holding a little clockwork made by a mad, psychedelic clockwork creator, and the effect is delightful. Their games are short, but between this and Psychonauts In The Rhombus Of Ruin, Double Fine is showing early mastery over beautiful VR animation. Mortal Blitz: Just kidding, I’m still talking about VR. This is nothing to talk much about, really. It’s like Time Crisis except you physically crouch behind boxes (and can blindfire and blind grenade throw by, well, doing that in real life). Actually ducking and leaning and aiming in real life adds fun and immersion, but ultimately, it’s a shooter game so the fun lasts a couple hours. Statik Institute Of Retention: A very clever VR puzzle game with silly but ominous overtones about machine intelligence. In-game, your hands are always encased in a puzzle box, which fits well in your brain because your hands are grasping the controller. Pushing buttons makes things happen on the box, and you’ve got to turn the box this way and that to see everything. It really tricks your brain into thinking your hands are in a box. The effect is clever. Prey is the pinnacle of Arkane’s craft. It has everything Dishonored had: a fully realized little world, the best level design in the industry (all respect to From), great art and tech. But it also has what Dishonored lacks: a balance to the character-build choice, which is to say that you can go no-psionics (the game gives your alien-based abilities the same existential unease as the Outsider’s Mark) and not feel deprived. The “choose your way to play” tagline is not merely a tagline, as it is in so many games these days. All skills are useful but none of them feel required. Well, Necropsy comes close. To all of that Prey adds a degree of the low-profile, big effect choice and consequence that made Deus Ex special. There are no real uninteractive cutscenes beyond the intro, and you realize after several plot points that things could have gone differently if you’d played a different way. And yet it’s never presented to you as a choice. That the game starts with a personality test is almost a joke because there are really no BioWare-style binary choices provided to you. You make choices by impulse during play, not as a separate mini-game. In so much of the game’s design, there is a trust in players that’s really rare. It’s an analog to the FromSoftware mindset of “no handholding, but keep it fair,” and it’s really gratifying. It’s one of those genuinely great games that are not only a joy to play but truly raise the bar in terms of design and will be remembered as a work that occupies a special place in the history of games design/development. Unlike many lesser works, which merely wear their influences and come off as derivative, Prey has wholly absorbed its forebears—System Shock, Thief—and feels like a visionary synthesis rather than the calculated corporate patchwork so many developers seem content to churn out. Is the story perfect? Not at all; it may well be Prey‘s biggest flaw, but it’s perfectly enjoyable and stronger than most. Everything else? Damn near perfection, mind the occasional bug. That’ll do it for this week, Gameologerinos. As always, thank you for reading and commenting. We’ll see you next week!